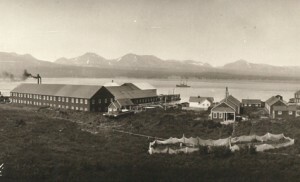 Alaska Packers Cannery, Chignik, Alaska, 1915. Photo courtesy of Anjuli Grantham. There are limited granting opportunities for humanities and preservation projects, and most require a 1:1 match. That means that half of your project expenses must come from another source (which can include in-kind and/or volunteer time). Some sources for grants can be found below. In this line of work, it is important to think creatively when it comes to project funding. Through partnerships, lots of fantastic work can be accomplished. For example, work with your city or borough to advance projects, partner with marine scientists and fisheries groups to access funds typically used for the sciences, and ask businesses and corporations to sponsor projects.